This unit is responsible for the establishment, evaluation and maintenance of all computer information systems, security, and software for the Onondaga County Sheriff’s Office. Some of their responsibilities include analyzing and defining the computer needs of the Sheriff’s Office, coordinating efforts with Onondaga County’s Department of Information Technology and vendors for all computerized information systems, and coordinating and providing the computer training needs of all Sheriff’s Office employees. Live-Scan: The Sheriff’s Custody Department utilizes computerized “live-scan” fingerprint technology to identify individuals through their fingerprints alone. Within minutes, the New York State Division of Criminal Justice Services provides positive I.D. directly from the prints, plus much more accurate arrest and warrant information directly to the Sheriff’s Office via electronic means. It utilizes inkless digital fingerprint scanning technology and color digital mug shots. This system takes all fingerprints, mug shots, signatures, and all arrest information (charges, demographics, etc.) in electronic format and submits them to the New York State Division of Criminal Justice Services computer in Albany. This information is shared and accessed by thousands of other police agencies, statewide, and in many cases, worldwide. Every arrest put into this system is searched and added to statewide and federal databases within minutes and is entirely paperless. Mug shots taken with this system now populate the New York State Division of Criminal Justice Services’ statewide mug shot database. In addition, there is a portable booking system, which allows the Sheriff’s Office to take mug shots, arrest, and demographic information in the field. TRACs: This new system enables a deputy to complete accident reports and issue tickets more efficiently by scanning the driver’s license and registration in the patrol car, and then transfer the data to Sheriff’s Headquarters, the DMV, and some courts electronically. License Plate Readers: Several sheriff’s patrol vehicles are equipped with License Plate Readers (LPR), which are designed to enhance a deputy’s ability to detect violations of law, recover stolen property, apprehend fugitives, assist in investigations, provide counter-terrorism resources, combat drug trafficking and assist in responding to Amber Alerts and Missing Adult Alerts. In-Car Cameras: Patrol vehicles are equipped with in-car camera systems. 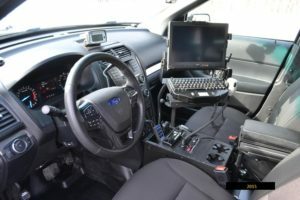 The camera systems enhance officer safety as well as the deputies ability to document and review statements and actions for both report writing and for courtroom preparation and testimony. They also accurately capture statements and events during the course of an incident. Networks: The Sheriff’s I.T. Staff routinely maintains networks and systems in 10 different buildings and over 80 marked patrol cars, 24 hours per day. CHAIRS (Criminal History Arrest Incident Reporting System): A deputy ensures the data integrity of the countywide CHAIRS System and provides essential maintenance and upgrades to transaction and translation files. This unit works closely with the Onondaga County Department of Information Technology and we are grateful for their support.